Leaving out of NYC is the best since we are just a 50min train ride away from GCS and 1 10 min cab ride to the pier. The money saved on transportation is just a start. 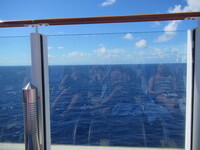 Boarding is easy and once aboard your cruise begins. Norwegians Freestyle cruising is the only way to go. With Freestyle cruising you do what you want when you want with no set times for breakfast, lunch, or dinner. The shows are performed at different times so you can work around them with the many other activities onboard. We had and always get the free drink package upgrade which is a must even if you don&apos;t drink alcoholic drinks. You can get soda water, soda, or limited juices that normally would cost you per drink. However we drink the hard stuff and with this package you can get anything up to a $15 value for free! The slides on the Escape were awesome. I rode the big tube one a dozen times and the one that drops you was fantastic I did that one 10 times. The first time being the scariest. I loved how they play a short music excerpt right before the gun goes off that drops the floor out from under your feet as gravity pulls you down and the ride is over in less than 3 seconds! Adrenaline rush like you cannot believe! The pools are fun and just big enough as well. I also enjoyed the ropes course several times. 3 stories on this ship with 3 zip lines one of which curves out over the side of the ship right over the water. However I was a little disappointed that the cameras were not functioning as I usually purchase one from either the zip line or the plank that walks out over the side of the ship. We enjoyed the new brew house with craft beers as we love our IPA&apos;s etc. However with it being the only bar that does serve craft beers with the best upfront location and all the views from the windows it was disappointing to us and all when they announced we all had to vacate for a private party. No fair since we paid to be there as well. This needs to be though out better on Norwegians side! Anyhow I could go on and on as all was great like usual...my opinion book one and try it you will love it! 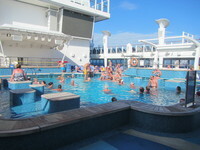 Excellent Cruise #4 with Norwegian Already have 2 More Booked! 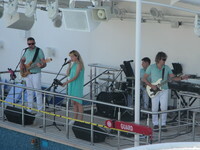 Band by the pool "Lets Groove" Excellent entertainers! Many happy swimmers at the adult pool. 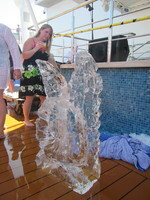 Ice sculpture by the pool. Leaving out of NYC is the best since we are just a 50min train ride away from GCS and 1 10 min cab ride to the pier. The money saved on transportation is just a start. Boarding is easy and once aboard your cruise begins. Norwegians Freestyle cruising is the only way to go. With Freestyle cruising you do what you want when you want with no set times for breakfast, lunch, or dinner. The shows are performed at different times so you can work around them with the many other activities onboard. We had and always get the free drink package upgrade which is a must even if you don&apos;t drink alcoholic drinks. You can get soda water, soda, or limited juices that normally would cost you per drink. However we drink the hard stuff and with this package you can get anything up to a $15 value for free! The slides on the Escape were awesome. I rode the big tube one a dozen times and the one that drops you was fantastic I did that one 10 times. The first time being the scariest. I loved how they play a short music excerpt right before the gun goes off that drops the floor out from under your feet as gravity pulls you down and the ride is over in less than 3 seconds! Adrenaline rush like you cannot believe! The pools are fun and just big enough as well. I also enjoyed the ropes course several times. 3 stories on this ship with 3 zip lines one of which curves out over the side of the ship right over the water. However I was a little disappointed that the cameras were not functioning as I usually purchase one from either the zip line or the plank that walks out over the side of the ship. We enjoyed the new brew house with craft beers as we love our IPA&apos;s etc. However with it being the only bar that does serve craft beers with the best upfront location and all the views from the windows it was disappointing to us and all when they announced we all had to vacate for a private party. No fair since we paid to be there as well. This needs to be though out better on Norwegians side! Anyhow I could go on and on as all was great like usual...my opinion book one and try it you will love it! Nice cabin with all you need to relax, sleep, clean up, enjoy baclony views and feel like home! We chose this as a beach day too. Try MayaChan private beach you will love it. For $59 you get transportation to and from (30min dirt road bummpy ride). All inclusive! Drinks, Food, your own spot with chairs loungers and shade, kayaks, stand up paddle, snorkeling gear, water shoes, pay for masseage cheap! etc...and ocean front! However bad weater or wind may bring seaweed as our day did....But its so beautiful you may not notice! We had to tender here and all went well. Right off the tender and onto the catamaran YAY! The catamaran was manned well and we shot across the ocean to a sandbar were the stingrays were abundant! Water was somewhat rough but it was good enough to get in and swim with the stingrays while the photograper took some great shot that we ended up purchasing. Back on th catameran for a nice leasurly sail back to the port! Enjoyed our shore excursion to The Monkey River and the second was a barrier reef snorkel. We decided we needed a beach day so we cancelled our excursion to avoid the bus ride and crowds. The end result was a nice day on the beach. However, we were harrased by the locals to buy their things and the would not take no for an answer. When we asked them where the extrance to the beach was they all said down to the right. I finally asked a police officer and he sent us back in the opposite direction! Mmmm not good! Anyhow we found the beach and got us a local vender who set us up with beach cahirs, umbrella and a bucket of beer. He even ran out and git us some local jerk chicken. This proved to be a good move, because my girlfriend decided to go out and do some shopping and if it was not for our helper David who came to her rescue she may not have made it back...just saying! She was immediately harrased by the locals who kept trying tho get her to come with them. David stepped in and took her shopping nad they still harrased him too! So in the long run of it NOT OURFAVORITE PORT! Long bus ride to the airboat. Airboat was the best part of this excursion. Then back on the bus heading in the direction we came and past to another location and long ride. (I&apos;m not a fan of the bus rides). Next stop alligator farm. Was fun and informative. After an hour we had enough but we had 3 long hours there with several activities. Just too long of a day doing much of nothing. Would choose for longer airboat ride and no alligator farm next time!